In the evening, 2 December, a gala dinner The Business of Fashion Voices in Russian style took place in the British Oxford. Natalia Vodianova got this year's Global Voices Award for her contribution to the fashion industry and in her honor this evening has been organized. 35-year-old supermodel wore Ulyana Sergeenko red velvet floor length party dress and Giuseppe Zanotti maroon boots with metal parts. Tonight she complimented her look with a pair of diamond earrings and rings. During the gala dinner, Natalia tried on Russian kokoshnik smiling and posing for photographers in it. 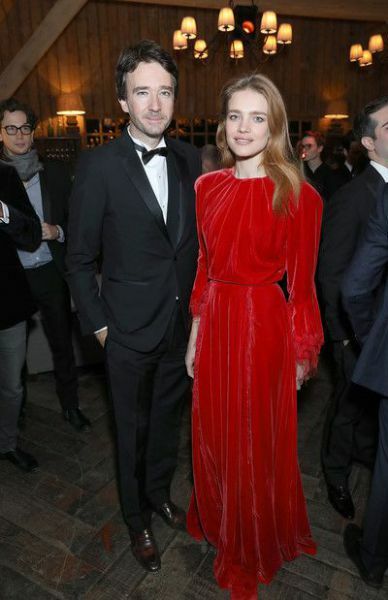 The model attended the dinner with her husband, a top manager of the company LVMH Antoine Arnault. Among the guests were also seen model Winnie Harlow, Ballet Dancer Sergei Polunin, the founder of the portal The Business of Fashion Voices Imran Amed and journalist Derek Blasberg.